First things first, you’ll want to plant your tree well away from your home. In a few years, your tree will be a beautiful, sprawling plant, and its branches can end up colliding with your home. Beyond that, your tree can become a hazard underground. Your tree’s roots may find their way to the foundation of your home, which could create cracks or even greater damage to the structure of your home. So, how far away should you plant your trees? Well, that answer varies from tree to tree, but here’s our rule of thumb: Big trees (which can reach up to 70 feet or higher in size) shouldn’t be planted within 20 feet of a home. Medium trees (which can reach between 30 and 70 feet) shouldn’t be planted within 15 feet of a home. Small trees (up to 30 feet) shouldn’t be planted within 10 feet of a home. If you’d like to plant trees closer to your home than these dimensions, then you should install a root barrier to keep roots from infiltrating your home’s foundation. In addition, you’ll have to keep an eye on branches that are sprouting from your tree, to ensure that they don’t grow dangerously close to your home. Now, your home may not be the only obstacle that can get in the way of your tree’s natural growth. Be wary of your driveway (which can be cracked by tree roots), as well as power and telephone lines. You may also have buried infrastructure that you should avoid (you can have utility locators out to your property to unveil buried infrastructure). You should stick to the rule of thumb that we mentioned before when planting trees near these obstacles. Okay, now that your trees aren’t going to collide with anything valuable or dangerous on your property, it’s time to think about trees running into trees themselves. When planting trees, consider how large their canopy will outstretch once they are full grown. While it’s alright to have some overlap in the canopies of your trees, you shouldn’t have main branches scraping up against each other. 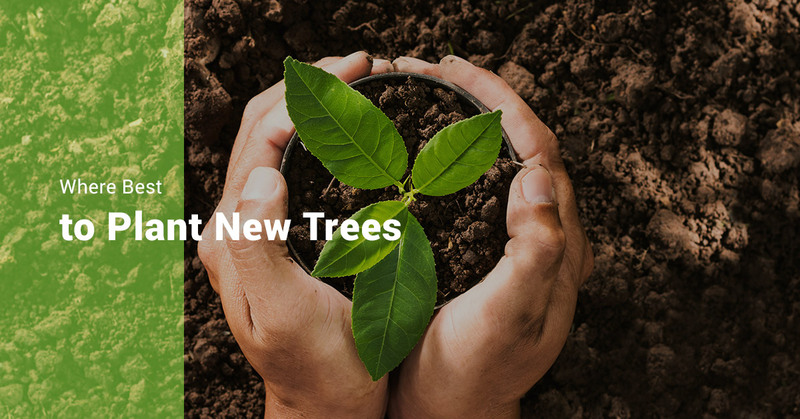 Spread your trees out a bit to give them plenty of space to grow, plenty of sunlight to absorb, and plenty of nutrients to consume from the soil. Don’t forget to consider where your trees will cast a shadow. While you may want to have foliage covering your patio, you won’t want to cast too much of a shadow over that backyard garden you have. Also, be wary that your trees could block valuable winter sunlight from southern windows. Consider where shade will be projected once your new trees are fully grown. Does your soil have everything necessary to support a new tree? Is it rich with nutrients? Will water permeate the soil? Be sure that you have good soil for planting, or ensure that you’ll be able to supplement your current soil with soil and fertilizer that will support your trees. You can also use a kit to check the viability of your soil for new tree planting. To keep your new trees growing into vibrant, healthy plants, you can count on the crew here at Lumber Jack and Jill. We provide a variety of tree care services, including tree trimming and plant care. Reach out to us today to learn what we can do for you! Again, we offer tree care services for folks throughout Northern Colorado, including residents of Fort Collins, Greeley, Loveland, and Wellington.